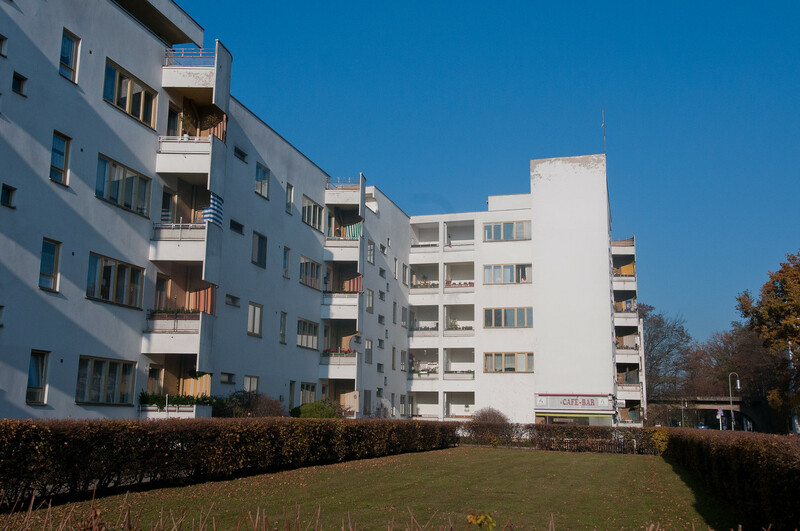 The set of housing estates in the Berlin Modern Style provides outstanding testimony to the implementation of housing policies during the period 1910 – 1933 and especially during the Weimar Republic, when the city of Berlin was characterized by its political, social, cultural and technical progressiveness. 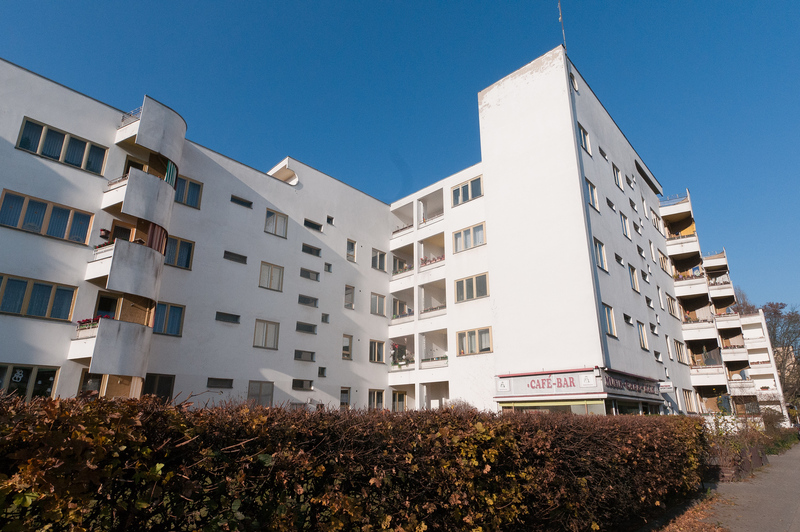 The housing estates reflect, with the highest degree of quality, the combination of urbanism, architecture, garden design and aesthetic research typical of early 20th-century modernism, as well as the application of new hygienic and social standards. 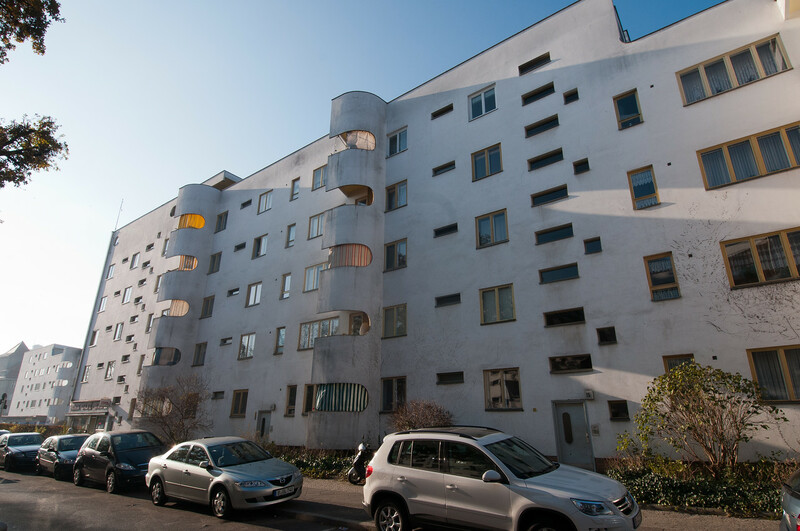 Some of the most prominent leading architects of German modernism were involved in the design and construction of the properties; they developed innovative urban, building and flat typologies, technical solutions and aesthetic achievements. As I’ve stated before, architectural world heritage sites are often the least interesting to the casual traveler. The buildings usually aren’t famous and often the architects aren’t famous either. To top it off, the buildings often aren’t open to the public because they are still in private hands. In the case of the Berlin, Modernism Housing Estates has all of the above problems. If you are a student of architecture or urban planning, the housing estates might be interesting, but I think most people would walk by without ever noticing they have world heritage status on a par with the pyramids or the Taj Mahal. There are six different collections of these estates surrounding Berlin. Many of them are not easy to get to and would require a long bus ride or taxi to get there. The one I visited was the Großsiedlung Siemensstadt which is very easy to get to. Just take the U7 subway line and get off at the Siemensdam station. The moment you walk out of the station you will see some of the buildings. Walk a few blocks into the neighborhood and you can see some historical signs talking about the housing estate. The Berlin Modernism Housing Estates is a collection of six housing estates that are located in Berlin, Germany. This ensemble of housing estates was added to the UNESCO World Heritage Sites list under the Cultural category in 2008. This property was constructed during the 20th century specifically during the time of the Weimar Republic. This time signaled a time of social, political and cultural growth in the city of Berlin. Hence, these housing estates are more than just a work of architecture but also a significant economic and social emblem for the city. The Berlin Modernism Housing Estates were built from 1919 to 1934. They showcase exemplary residential architecture during the 1920s era. Hence, these housing estates were collectively recognized by UNESCO as one unit of the property when it was added to Germany’s list of UNESCO sites. During the German Empire, the standard architecture for residential properties consisted of cramped flats and a dark backyard. Hence, these homes lacked daylight and many of them did not meet basic hygienic standards. This prompted the building of bright and well-lit apartments. This building reform movement was initiated at the start of the 1920s in an aim to respond to the need to build better homes and apartments. The buildings that were included in this UNESCO site serve as evidence of the social housing that developed not only during this particular time period but throughout the 20th century. Aside from responding to the desire for safer and better homes, the Berlin Modernism Housing Estates also introduced a new urban and architectural design solution. This new design concept featured aesthetic and technical innovations that were unique to the times. The architects that worked on these projects were Walter Gropius, Bruno Taut, and Martin Wagner. Their works, later on, created a huge influence on the housing developments around the world. Gartenstadt Falkenberg: This house located in Bohnsdorf was designed by Bruno Taut and was built from 1913 to 1916. Siedlung Schillerpark: This housing estate is located in Wedding, Germany. It was also designed by Bruno Taut and was completed in 1930. Großsiedlung Britz: This housing estate is located in Britz, which was planned by Bruno Taut in collaboration with Martin Wagner. It was completed in 1930. Wohnstadt Carl Legien: Completed in 1930, this was a product of the collaborative work between Bruno Taut and Franz Hillinger. Weiße Stadt (White City): This was planned by Otto Rudolf Salvisberg with the help of Martin Wagner. It was completed in 1931. Großsiedlung Siemensstadt: This was one of the last properties to be built among the list of properties in the Berlin Modernism Housing Estates. It was co-planned by Martin Wagner and Hans Scharoun.